With the risk of terrorism and public violence growing in certain parts of the world, emergency responders face an immense challenge: to get dangerous situations under control quickly without restricting too many freedoms. Maintaining this balance requires figuring out which measures are necessary and what actions might step over the line, as well as how modern technology can help track these risky situations. In the lead-up to the G20 conference, the Hamburg police have optimized digital connectivity between police headquarters and on-site personnel so that everyone gets the same view of the event. When the Ministerial Council of the Organization for Security and Co-operation in Europe (OSCE) met in Hamburg in early December 2016, the German city had to conduct the largest police operation it had ever orchestrated, with 14,000 police officers providing security and protection. And this was only a warm-up for the G20 conference that’s scheduled for July, when government and financial leaders from industrialized and emerging economies around the world will gather in Hamburg to discuss how to shrink disparities in development and minimize poverty. Although police work often involves bringing a wide range of data—such as live traffic feeds, maps of emergency responder positions, and geodata from different government agencies—together in command centers, the Hamburg Senate determined that these two events required a new solution. The idea was to pool all the data together in a shared geoplatform where people working at every level of the command structure could access the information in real time. 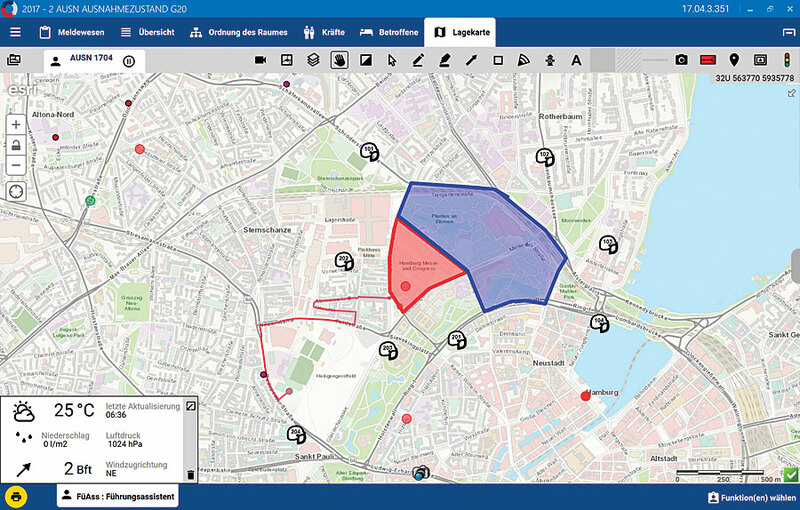 The backbone of the geoplatform—and of Hamburg’s smart policing initiative—would be ArcGIS. To make everyone’s information work together seamlessly, Esri partner Eurocommand built CommandX, a 64-bit system that communicates with ArcGIS Server and Portal for ArcGIS—both components of ArcGIS Enterprise, which lets users run enterprise GIS on their own infrastructure and behind firewalls. CommandX enables data to be shared rapidly and securely. 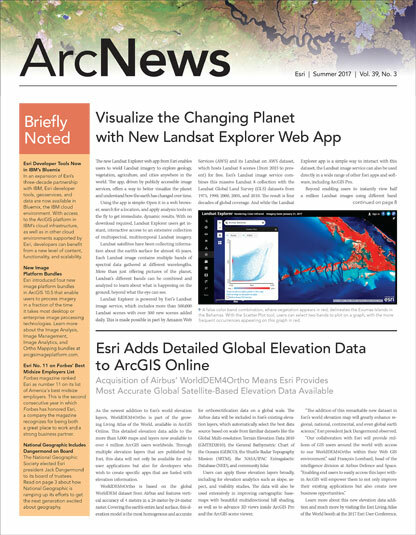 It has a bidirectional interface with ArcGIS, so users get live access to the basemaps, layers, and data and can edit services and save web maps. With this, personnel at all levels of the police and firefighting command structures can use the layers and local data—which are housed in a central geoplatform—to describe the on-site situation. Additionally, staff in operations centers now use Bluetooth-enabled electronic whiteboards from hardware and software developer SMART Technologies to adjust situational data simultaneously. So everyone involved in the exercise can always see the most current planning and situational information on a map. With CommandX and the new hardware, all members of the command structure can receive a realistic picture of the on-site situation without being there themselves. Thus, emergency responders for the OSCE meeting in Hamburg were going to have a crucial advantage that they hadn’t had before: the ability to get ahead of a problem and act with confidence instead of merely reacting to an escalating situation. Getting to this point meant that there was a lot to do in a short amount of time. In all, it took three months for the Hamburg police—working with Esri, Eurocommand, SMART Technologies, and information and communication service provider Dataport—to implement the concept. Additionally, Esri and Eurocommand spent four weeks training the 700 police staff who would be engaging with the system as viewers, publishers, and administrators. The first trial run of the geoplatform happened on October 8, 2016—the day Germany’s national men’s soccer team played the Czech Republic in a 2018 FIFA World Cup qualifier game at Hamburg’s Volksparkstadion. Not only did the German team play together smoothly, winning 3-0, but all the agencies running security for the game, which drew a reported 51,000 fans to the stadium, worked together seamlessly as well. The reconfigured technology delivered good results. On December 8, the Hamburg police were ready to coordinate security for the two-day OSCE meeting. For the event, 10,500 local police officers worked with 2,700 members of the German federal police and 700 members of special forces units. Approximately 3,000 police vehicles were on the road to protect the 1,500 accredited conference participants. Before the OSCE meeting got under way, employees from the top command unit of the police assembled in front of a large video screen with liaison officers from the fire department, homeland security organizations, the federal police, the elevated railway system, and the armed forces. With all the information in front of them, they were able to make crucial decisions about unit movement and road barriers on-site, right away. The OSCE meeting took place without any incidents, thanks in large part to the coordinated security. Using the new system for the OSCE meeting was largely a learning opportunity for how to use trailblazing technology and get a large command staff to work together and with people in the field. In the lead-up to the G20 conference, the Hamburg police have optimized digital connectivity between police headquarters and on-site personnel so that everyone uses the same digital map to get the same view of the event. Additional content has been added to the geoplatform, and further infrastructure improvements have been made as well. Using CommandX, along with the geoplatform and other smart technologies, doesn’t have to be limited to coordinating security for big events, either. In the long term, the Hamburg police intend to use components of this system to support their everyday work in smart policing. Having such a vast network of interconnected data could help the police analyze burglary statistics, for example, to predict where organized groups of burglars are most likely to strike. Additionally, the department could survey social media data to forecast protester movements during demonstrations. By making security forces more effective every day, this system also makes Hamburg safer and more secure. For more information, email Heiko Claußing of Esri Deutschland GmbH.